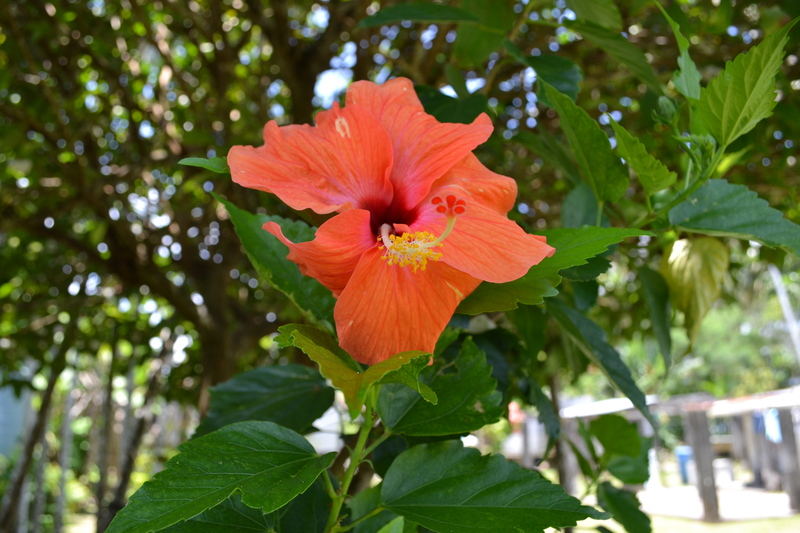 A couple of years ago I posted this story and as it has such vibrant tropical flowers I thought I’d share it again. Back in 2012 I planned to upload 365 photos over the year, with each image as a stand-alone “event”. In the end I posted on 173 days, but uploaded 466 photos, and couldn’t resist adding commentary to most. 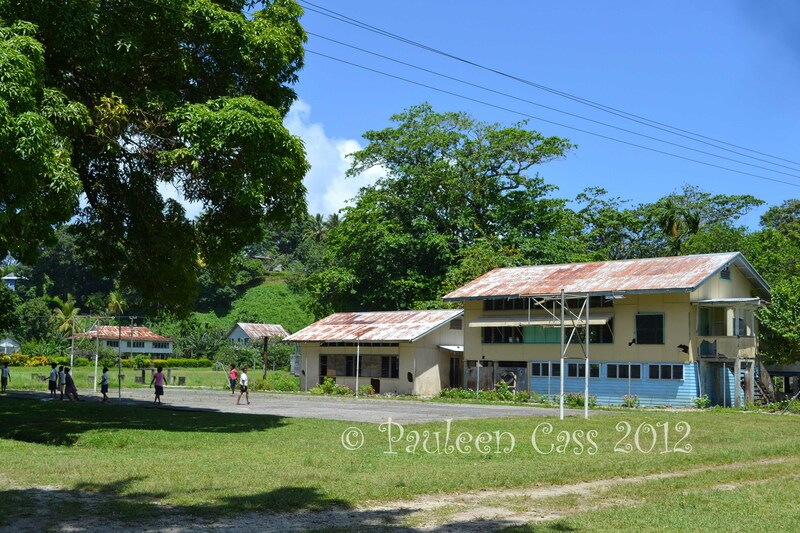 This post included some of the photos we took on our 2012 trip back to Papua New Guinea when we mainly visited Alotau and Samarai. 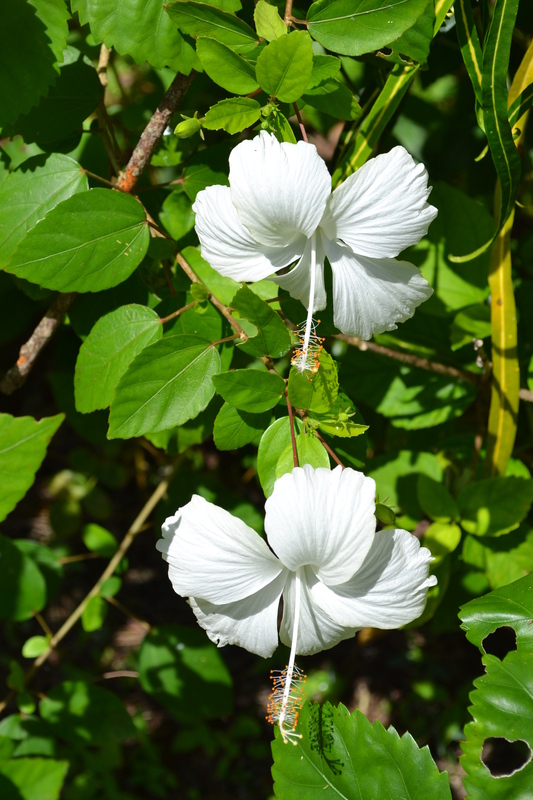 We wondered how many of these magnificent hibiscus were descendants of my mother-in-law’s 1960s hibiscus collection, some sourced from as far away as Hawaii. And to place them in context, this is the view from the house the family lived in on Samarai. Sadly the house is no more. If you want to read more about our experiences on this sentimental return voyage, you can read them on this link to my other blog, Family History Across the Seas. I hope these gorgeous flowers have brought sunshine and happiness to your day. I’ve been rather neglectful of this blog over the past few weeks. Firstly I had a week away in Brisbane with a defunct laptop, then I returned home to find that our much loved tabby cat had disappeared. Three weeks later we’re none the wiser as to what happened to him and exploring every option has taken a fair bit of time, not to mention coming to terms with the absence of his little furry self. However here I am again, gearing up for the April A to Z challenge, with at least some of the posts ready to go. Today I want to post what may be the last of my Papua New Guinea photos. 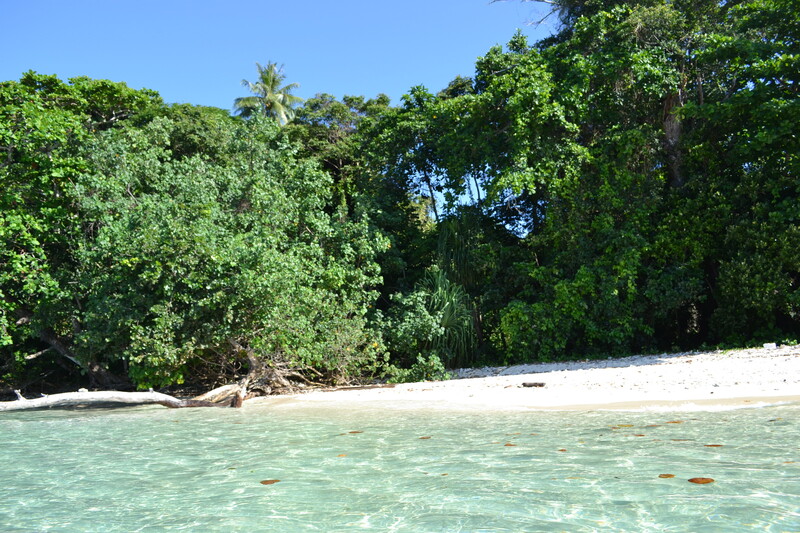 This time it’s a brief glimpse of our outing to a small island off Samarai in Milne Bay. My husband used to visit Deka Deka when he was a small boy so he was particularly pleased to be able to dive into its crystal clear waters. A member of our small group went snorkelling and reported that the coral had been damaged by storms etc, but it certainly didn’t spoil our enjoyment of a brief excursion. I’ve previously posted images of the Catholic church, which is still functioning and the Anglican church which has fallen into disrepair. 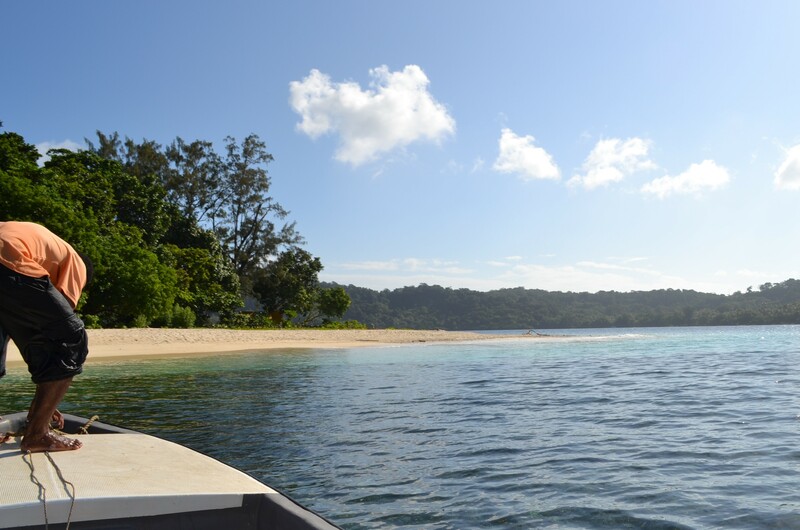 Perhaps it’s indicative of the influence of those particular religions in Samarai, whereas over the northern coastline from Milne Bay, the Anglicans held sway at Dogura. 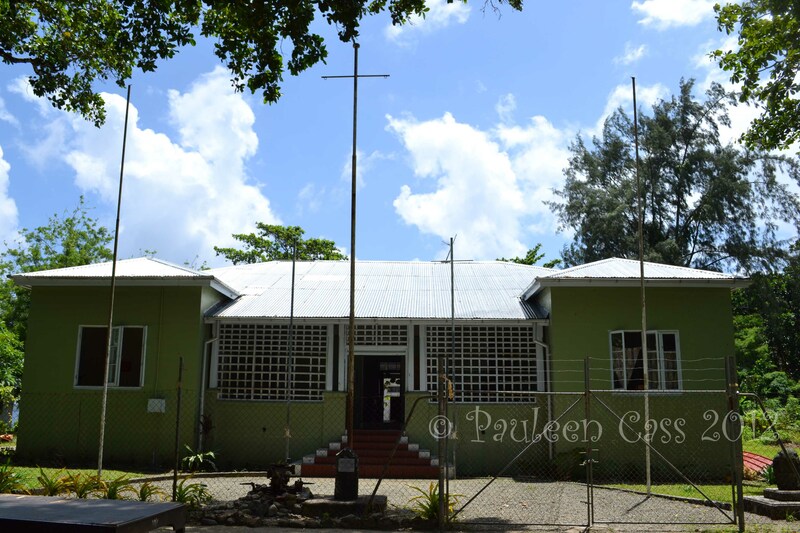 The United Church building at Samarai is still in use. Today we see the United Church building at Samarai. We’ve always been amused by this because to this day, the Presbyterian-Methodist combination in Australia is still “Uniting” whereas in PNG it’s been “United” since the 1970s. The Catholic church, side view, showing the tempting view of the ocean. I’m also including a side view of the Catholic church which we’ve visited previously. It’s hard to imagine how people kept their concentration on worship with views out to the water: perhaps it was inspirational or perhaps just a distraction to wonder if the fish were biting. 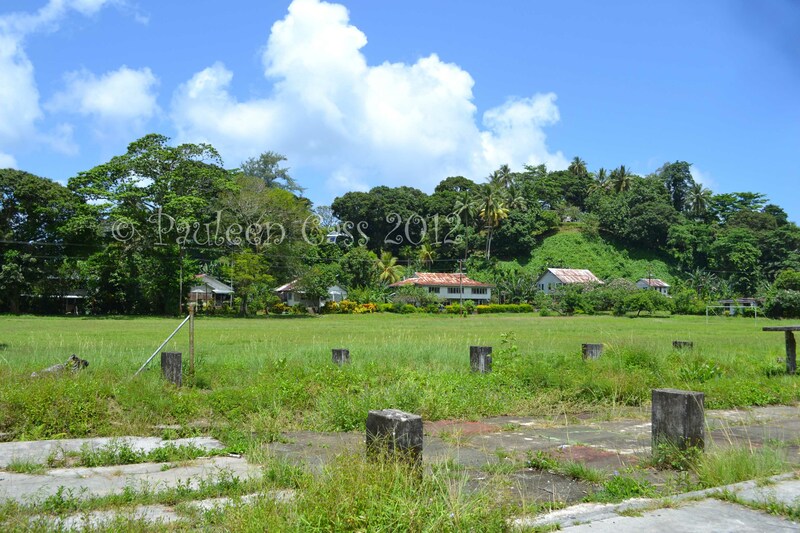 The Memorial Hall was the venue for balls and socials for the small group of people living on the island of Samarai….if those walls could talk. In front of the building you can just see a memorial: this was erected on the 50th anniversary of Gallipoli, 25th April 1965. Peter’s parents were probably there but he was at boarding school. 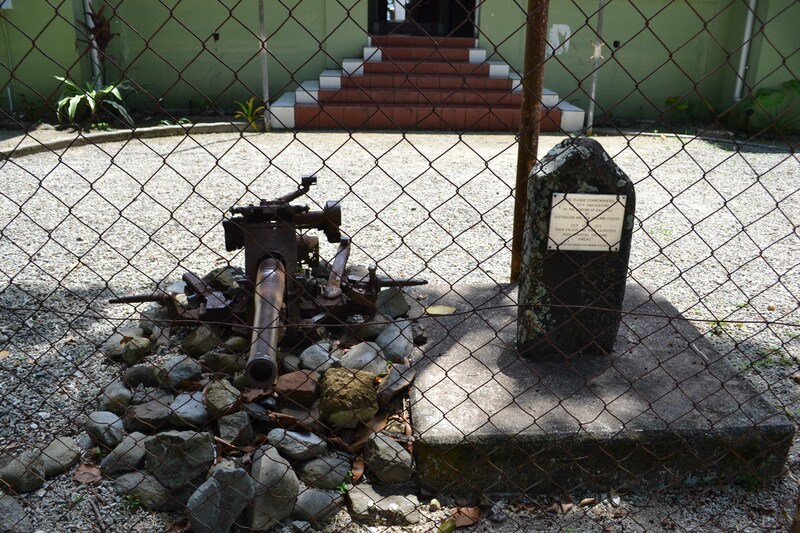 The gun and Gallipoli memorial. 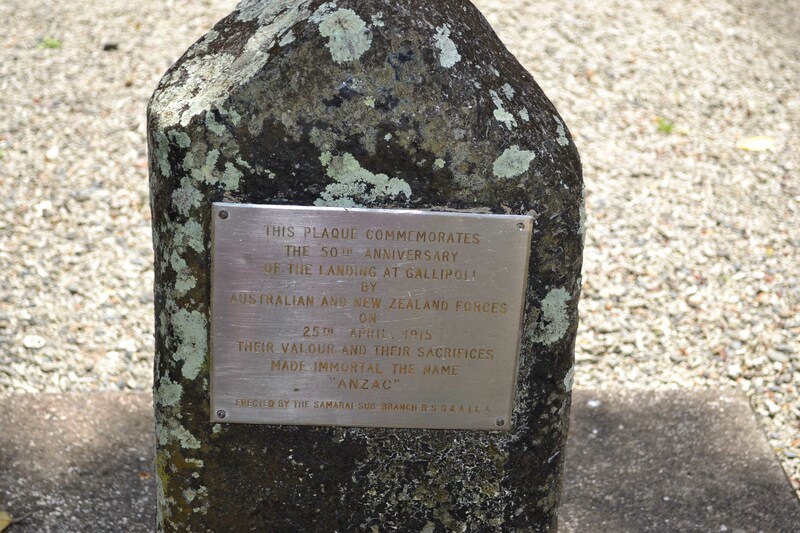 The Gallipoli memorial: this would have been of significance to my mother-in-law whose uncle died at Gallipoli. 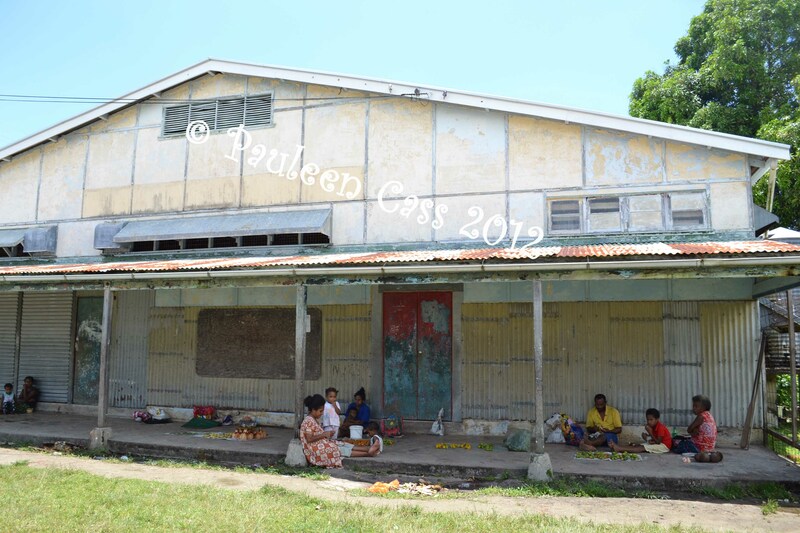 This photo shows the old primary school at Samarai which has particular significance to my husband’s family: his mother taught in the small, low-level classroom to the left of the two storey building. 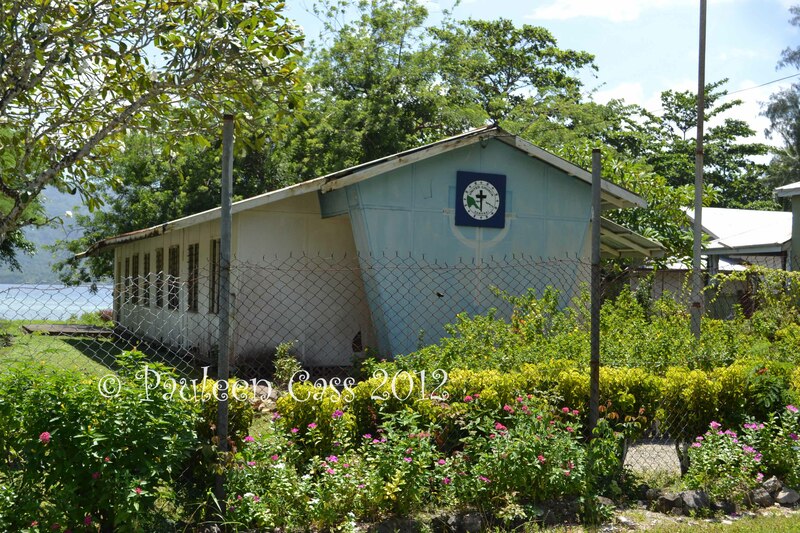 The old primary school at Samarai, now out of use. Also in the background are the old houses which used to accommodate the senior staff of Burns Philp and Steamships Trading Company, both businesses of some significance in times past. Steamies and BPs housing and the concrete remains of the Samarai Club. The concrete stumps are all that remains of the old Samarai Club and the billiard table. Below: the old headmaster’s house. 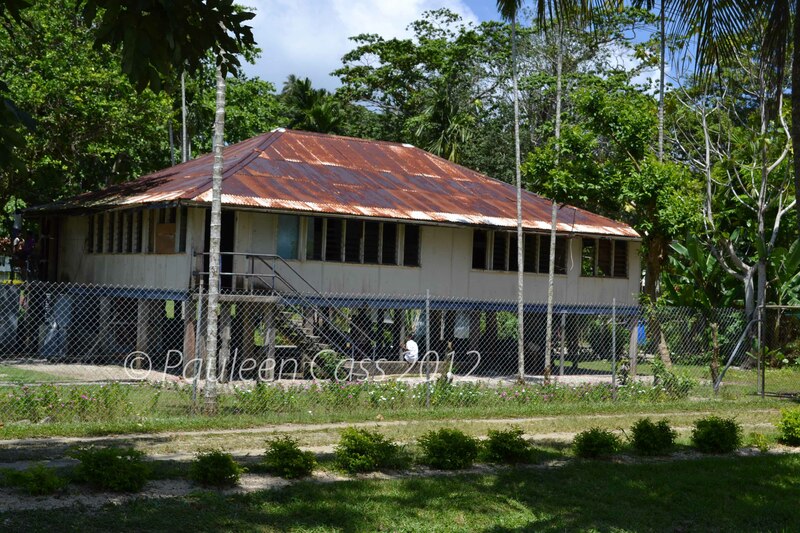 The old primary school headmaster’s house, Samarai. 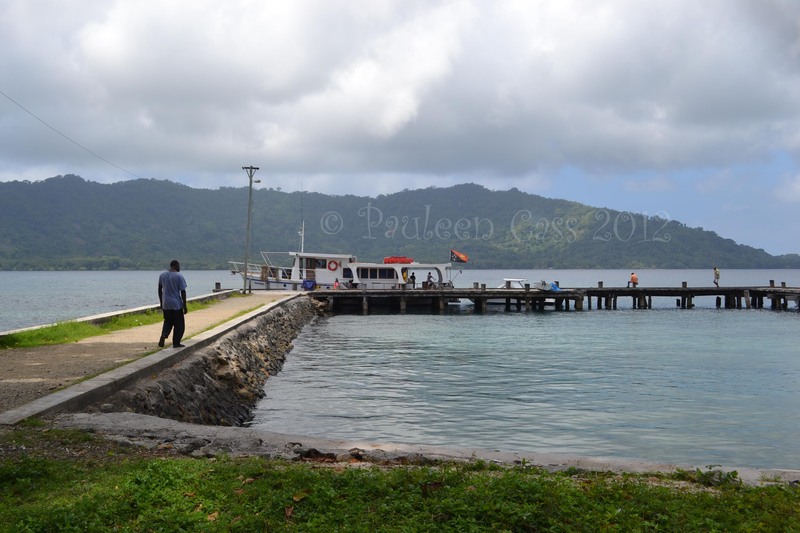 This is the old government wharf at Samarai in late 2012. It’s hard to believe that only a few decades ago this was a busy hub for maritime activity, not to mention the Catalina flying boats that flew in near here. 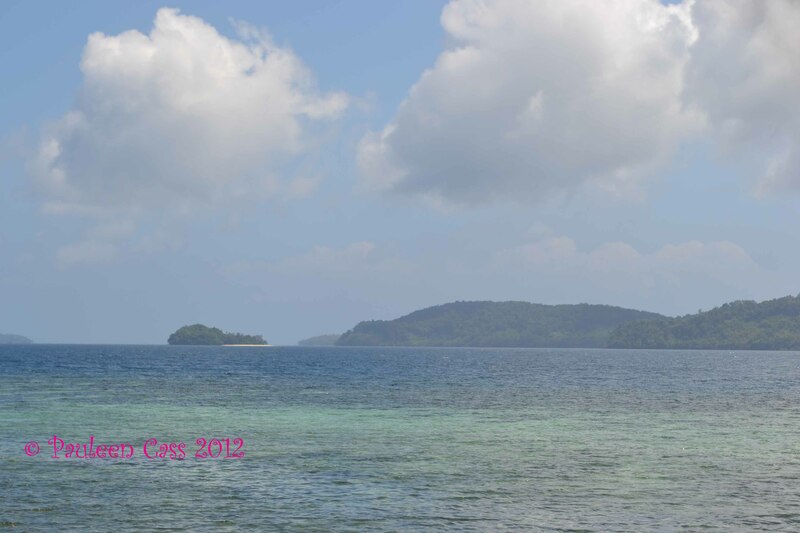 The island in the background is Logeia. This Shell depot lies forgotten and untended in Samarai. I liked the industrial beauty of it. I was struck at the time by the stylistic similarity to a much more glamorous structure on the far side of the world. 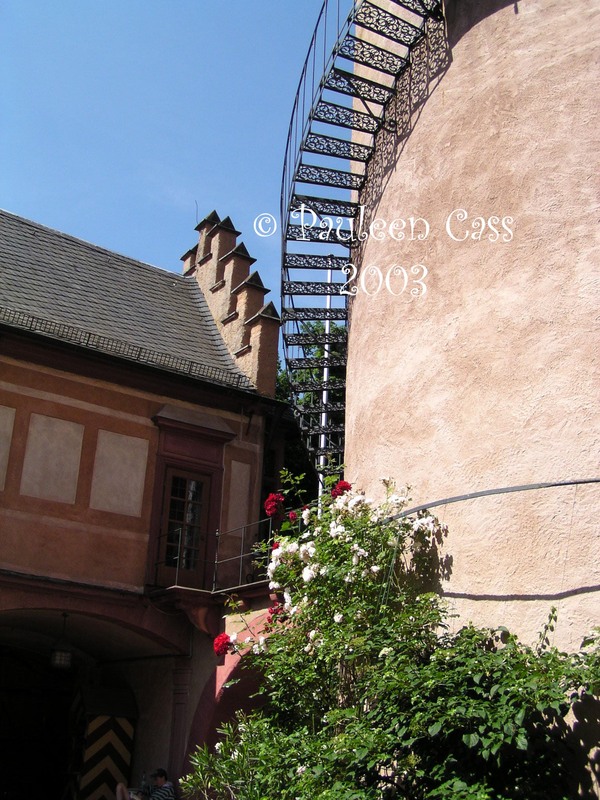 The stairs around the turret of the Mespelbrunn castle in Bavaria. Well as you can see I’ve lapsed once again with getting my images uploaded. I think the secret is to post every two or three days. I’ve now got three other blogs on the go (family history, books and local history) so they’re keeping me pretty busy. However I’ve also committed to following the 2013 A to Z Challenge. In 2012 I did this on my Family History Across the Seas blog but this year I’m going to post using this blog, Tropical Territory. My response to the series will be all about places in the Top End of Australia (mainly the NT Top End and sometimes northern WA or central Australia, NT) – a travelogue and photologue of some of Australia’s perhaps less well-known places. In the meantime I’m going back to posting photos of our recent PNG trip. I’ve still got heaps of NT photos but I for one feel like a change. So join me as we walk down what used to be the main street of Samarai for many years. It could get quite busy with the arrival of cruise ships, freighters and the Catalina flying boats. 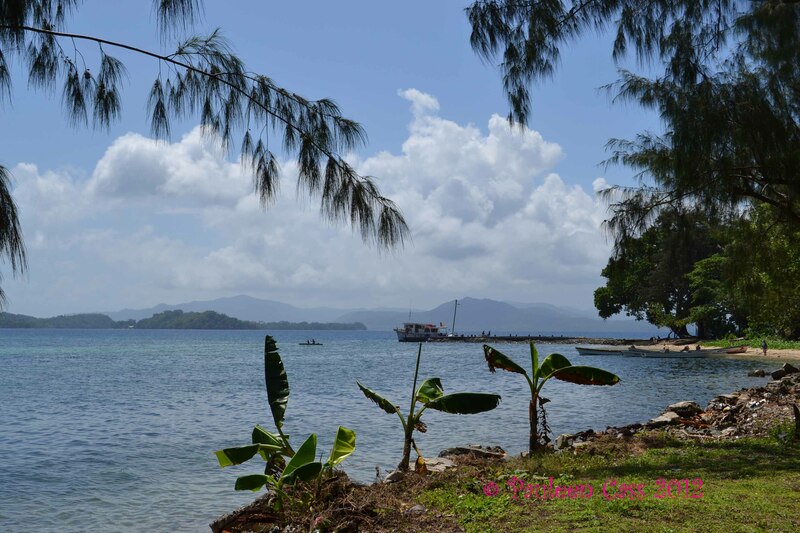 When we visited Europe for the first time in the early 1970s, the only people who had any idea where PNG was, were the Greeks, precisely because their ships had come along that route. 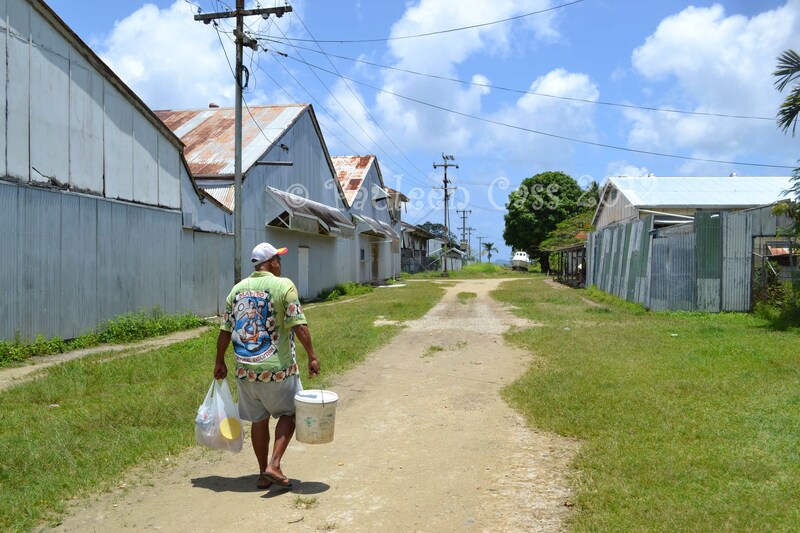 As you see the main street now looks rather deserted though in fact there’s still an active community on the island. It’s “just” that many of the services have gone. Mr Cassmob remembers the day when, as a small boy, he heard voices under their house. On inspection he discovered a couple of women from one of the cruise ships happily searching through his family’s shell collection, blissfully unaware that they were trespassing on his family’s property and garden. They enquired in rather staccato English, as if they were talking to the village idiot, how much the shells cost. He decided to sell them and make a bit of pocket money,but you have to wonder about people, don’t you?! 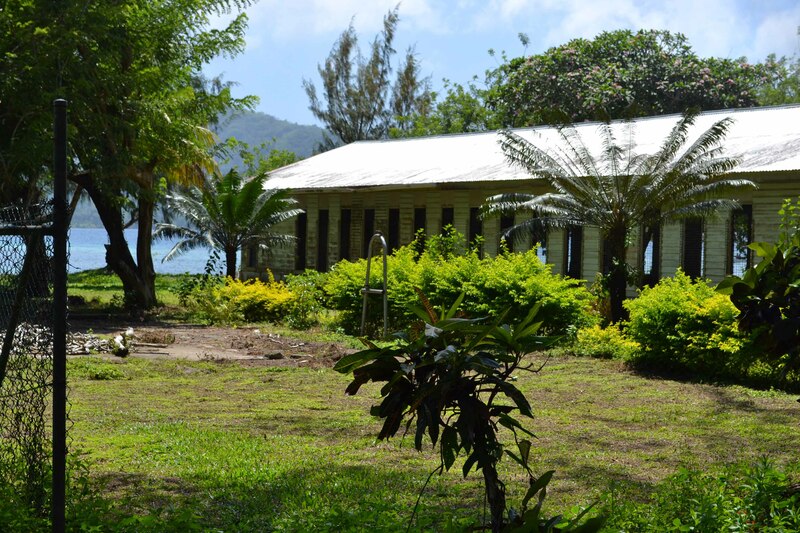 Burns Philp (BPs) and Steamships Trading Company both had thriving stores on the island and it was from them that our groceries and hardware were shipped, on order, to Alotau. The buildings remain but are essentially unused. 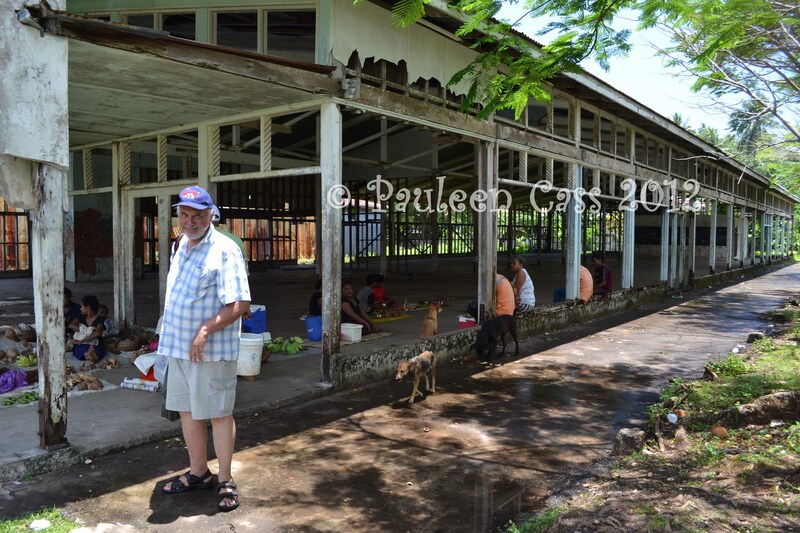 The BP store is now being used like a market to see betel nut (buai) and sweet potato. Although Mr Cassmob worked at these places during his school holidays he was remarkably sanguine about their current state of inactivity. 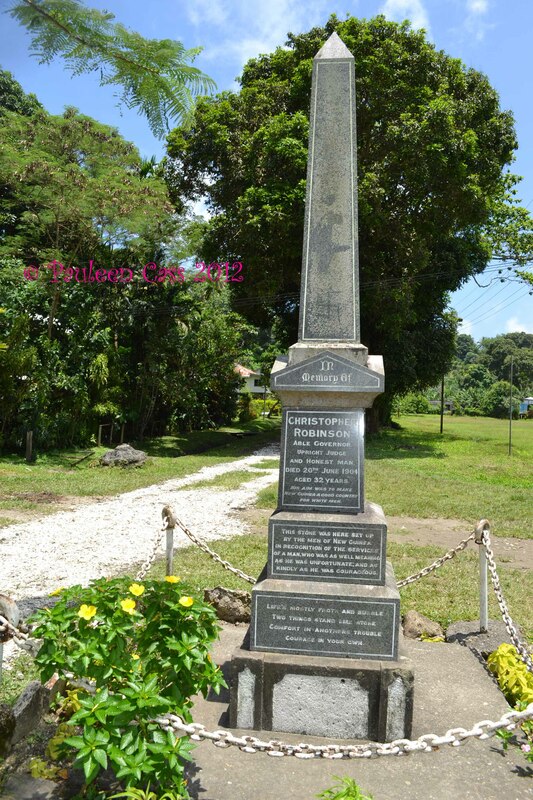 This memorial stands near the playing ovals on Samarai Island. Largely neglected, and probably totally ignored, people pass it daily. 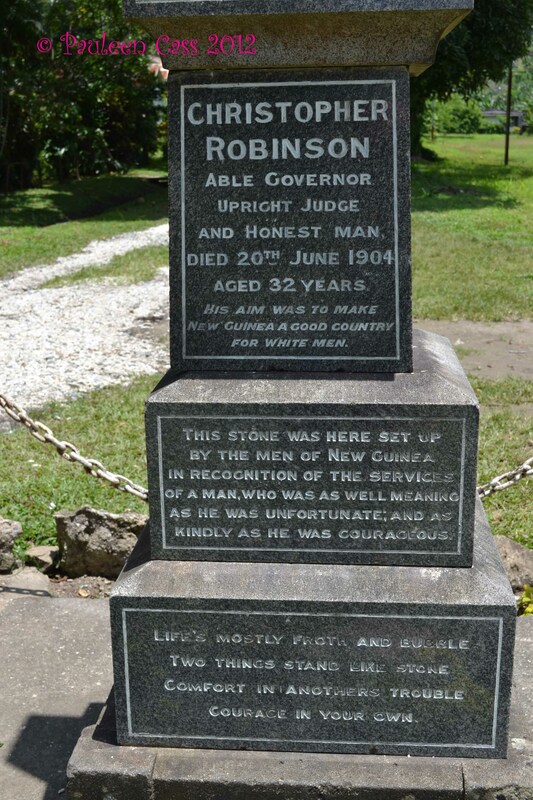 There is a highly controversial story behind this young man’s death, which I’ve briefly relayed on my Trove Tuesday post on the other blog. 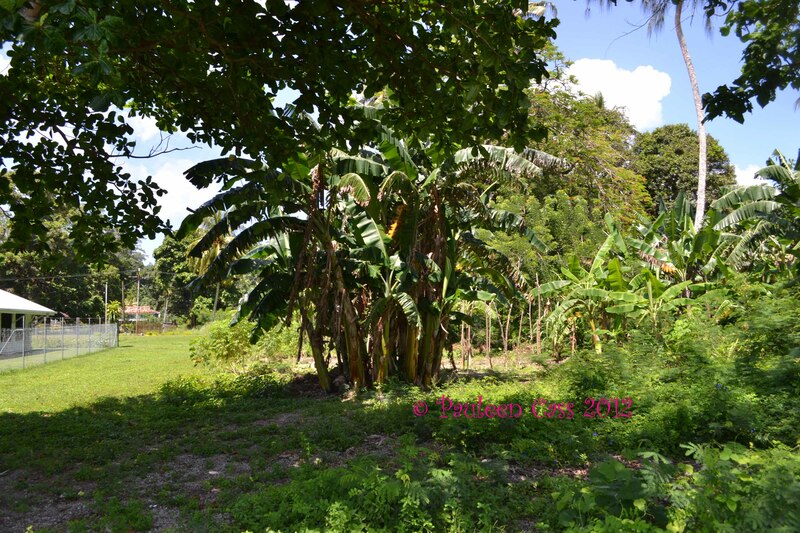 These photos are part of Mr Cassmob’s family heritage: the site where their house was situated when they lived on Samarai. Sadly the house is no more, nor are the others that were their neighbours. Now the new neighbours are the Council offices. 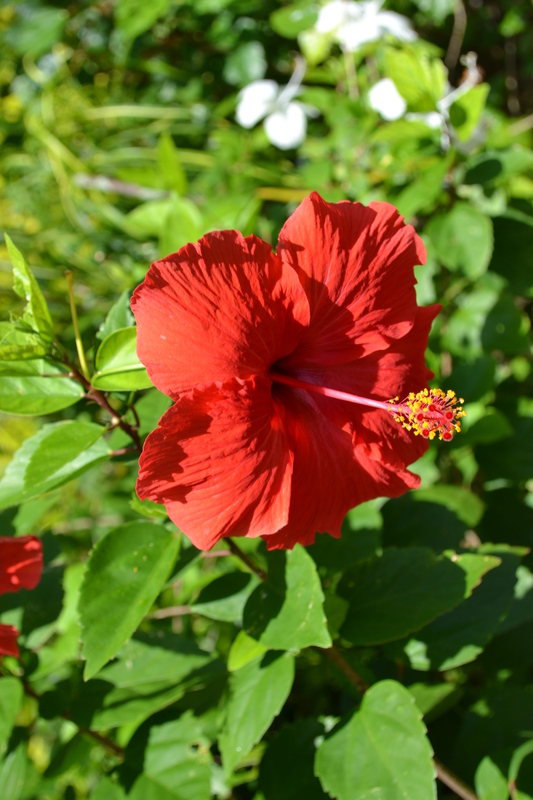 There is nothing left of the BBQ or the hibiscus or……just the memories. The site of Mr Cassmob’s family’s home for about eight years in the 1960s. Our family has heard various tales about their life here, one of the more amusing being how their cat would use the crab holes in the sand for his toilet. Wouldn’t you like this view, looking out to sea from the house and across to Logeia Island then down to the wharf in the other direction. 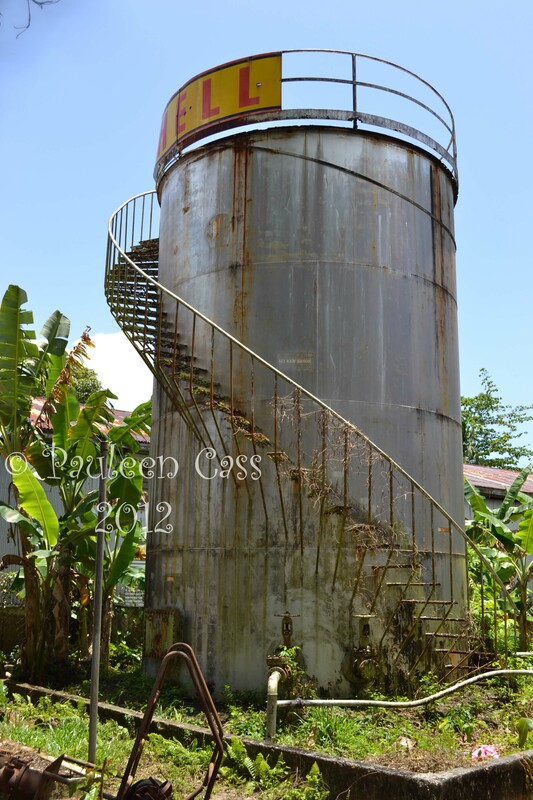 All photographs are copyright Pauleen Cass 2012. Looking to the left of the house, towards Deka Deka, the small island on the left, past Logeia.